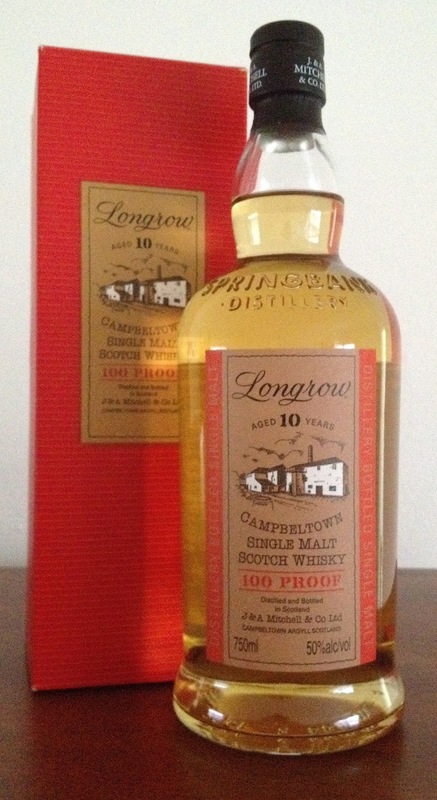 Springbank has released two different versions of Longrow 10 Year 100 Proof - one for the UK at 57% (100 British proof) and one at 50% (100 American proof). The American version first showed up in the US in 2008 but has since been discontinued (as with most of the age-dated Longrow lineup). Unlike the standard Longrow 10 Year at 46%, which is a mix of ex-bourbon and ex-sherry casks, Longrow 10 Year 100 Proof is entirely from ex-bourbon casks. Nose: new make spirit and pine, damp peat smoke and wood ash, fresh oak, pickle juice, green malt, lightly floral, plastic, peaches, savory orange peel, mint, bubblegum. After adding a few drops of water the malt becomes cleaner and sweeter, integrating with the floral and bubblegum notes, the cask influence ramps up with some vanilla coming out. Taste: malt and cask sweetness up front with light floral/lavender notes, transitioning through vanilla and green vegetal/new make/pickle juice flavors starting in the middle, light fresh oak/caramel and more floral notes near the back, a touch of fresh peat rides through it all in the background. After dilution the sweetness expands and covers up the new make character until the very back, the oak expands to give it a little bit greater sense of maturity and a peppery quality, and unripe fruit (apples, pears, berries) comes out. This whisky honestly feels kind of underdone and not what I would expect from a Longrow. I'm guessing all of the casks were refill because the wood impact is very minimal and has done little to diminish the new make character of the spirit. Some of that clears after fifteen minutes or so in the glass, but it's still not what I expected before opening the bottle. I had hoped for something akin to Ledaig 10 Year - a bold whisky with big peat flavor tenuously balanced by bourbon cask influence. Instead it feels like a bunch of weak casks that had lost their peat too quickly were tossed together - this seems even less peated than Springbank 10 Year. Especially given that the remaining bottles in the US are going for close to $100, I can't really recommend it other than for the sake of curiosity. 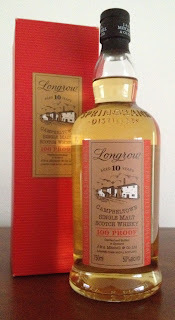 If you're going to buy a discontinued Longrow, make it the CV. For a different but no more complimentary review from the same bottle, check out Michael Kravitz's post. Dun Bheagan is a line of single cask and regional batch single malts produced by the independent bottler Ian Macleod, which now also owns Glengoyne and Tamdhu. The regional malts are at the bottom of the range and compete with similar lines from Morrison Bowmore (McClelland's) and Cadenhead's. The breadth of the Dun Bheagan lineup, which includes Island, Lowland, Speyside, and Highland in addition to Islay, implies that they are sourcing most of the stock from other distillers. The sources have never been explicitly revealed, so customers have to guess the sources, while leaving Ian Macleod with the freedom to change the components as contracts and supply change over time. However, it is important to note that these are single malts rather than blended malts, meaning that each batch will only contain whisky from a single distillery. All of the regional malts are 8 years old and bottled at 43% without chill filtration and possibly without coloring. Nose: heavy American oak, cedar, pine, cured meat, raisins, salinity, peat, malt in the background. After adding a few drops of water, the pine and peat come together and gain some prominence over the oak, the cured meat pops out more. Taste: big malt and wood sweetness up front, thick berry notes beginning around the middle, smoothly giving way to tannins towards the back where the peat finally makes itself apparent, giving a character like used black tea leaves. After dilution, the alcohol becomes a bit more noticeable while smoothing the sweetness and oak together, while bringing out some vanilla and pushing back the peat even further. My first guess is that this batch of Islay 8 Year was sourced from Laphroaig, because of the character of the peat and the oak, which reminds me strongly of their first-fill Makers Mark barrels. Given the relative lack of peat and strength of the oak influence, my guess is that this was a parcel of casks that were deemed to be outside the acceptable range for the standard Laphroaig 10 Year or any of their NAS expressions. With that said, the piney character makes me think that it could also be Caol Ila from first-fill ex-bourbon casks, though that would suggest that Ian Macleod was using their own casks, as Caol Ila is almost exclusively filled into refill hogsheads by Diageo. So, it's a mystery. But a tasty mystery. Given that I paid under $40 for this, I would call it an excellent bargain. It's extremely hard to find Islay single malts for that kind of money anymore and this hits the spot of being easy drinking without being boring. Highly recommended if you happen to spot it.